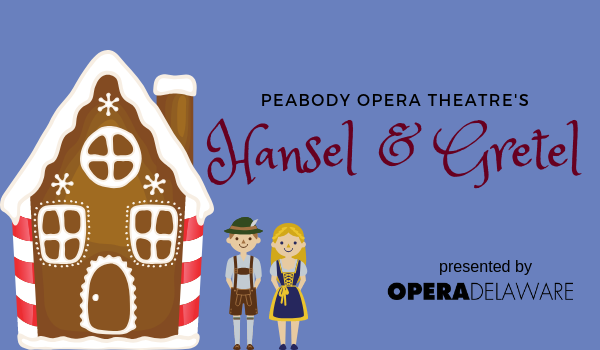 Dec. 8, 2018 | Just in time for the holidays, OperaDelaware presents Peabody Opera Theatre's Hansel and Gretel! Composed by Engelbert Humperdinck and based on the popular Brothers Grimm fairy tale, this charming children's opera is fun for the entire family. If purchasing tickets for a PTA fundraiser, be sure to type your PTA’s name in the “COMMENTS” field after clicking the BUY TICKETS button. Just in time for the holidays, OperaDelaware presents Peabody Opera Theatre's Hansel and Gretel! Composed by Engelbert Humperdinck and based on the popular Brothers Grimm fairy tale, this condensed version of the charming children's opera features beloved characters and delightful folk music-inspired melodies such as "Evening Benediction." When brother and sister Hansel and Gretel get lost in a forest, they are lured into a mysterious candy house, where they must outsmart the evil Gingerbread Witch. This fun, fully-staged production is a wonderful introduction to magic of opera — perfect for elementary school children or anyone young at heart. Performed in English. Estimated running time is 45 minutes. ABOUT PEABODY OPERA THEATRE: Peabody Opera Theatre performs community outreach operas performed entirely by Peabody Conservatory students. For more about Hansel & Gretel and Peabody's outreach programs, go here.